George Osborne told his City of London audience this week that he's not dogmatic about private being good, and public bad. But there's not much doubt that he thinks private banks are preferable. And he can say it more clearly now that he's unshackled from coalition with the Lib Dems. In the same speech, the chancellor announced a sell-off of half the remaining 30% government stake in Royal Mail. We've learned this morning that raised £750m. He offered the "staggering fact" that the continued sell-off of Lloyds Banking Group shares - of which the UK government continues to hold just under 20%, having sold off half its stake already - will be the biggest privatisation ever. That's at least until we see the shape of what's going to happen to Royal Bank of Scotland. With 80% of it still in government hands, institutional investors will get a bite at the first tranche, later this year. Unless something unexpected happens to the share price - currently trading around 30% below the break even price at which the stake was taken on - then the government will be making a loss. To suggest, as some have, that this is so that its chums in the City can make a profit is to misunderstand what's going on. It was not taken on as an investment. Indeed, the thinking back in 2009 was that we should brace ourselves for a whacking great loss. And if the institutional investors wish to take on RBS shares at their current price, they'll do so for what they're worth now. Even they have to remember that share prices can go down as well as up. The reasons for the RBS market valuation falling further would be another raft of vast fines for rigging markets, and legal challenges for its involvement in over-risky lending. Specifically, investors are challenging RBS over what Fred Goodwin and his fellow bosses knew about the state of the bank's risks in spring 2008, when they raised £12bn in a share issue a few months before it hit crunch point. To the upside, the reckoning is that the share price should be helped up by the very act of starting this sale. From a market analyst point of view, an 80% government shareholding has a dampening effect on the value of the other 20%. There's no reason, says George Osborne, why there shouldn't be a retail offer to the small investor. They invariably come at a discount. That means sacrificing a bit more of the value of the shares to the taxpayer. A more audacious plan, suggested before the election, was for a distribution of shares to every British household. That would reduce takings a lot further, particularly if it were to be on a meaningful scale. But by hook or (dare I say it) by crook, RBS is to be taken out of government hands. For some, that removes the opportunity to use a publicly-owned bank to serve the economy and social purposes. Other countries - and not just leftish ones - have banks which provide branch networks, small business lending, and accounts for the financially marginalised. That assumes privately-owned banks won't or can't provide these services, or that they can only be provided by government diktat. The way Britain has gone is to use regulation and political pressure to reach these objectives, and both the UK and Scottish governments have gone a limited way towards using their own funds to provide lending to growing businesses where the market doesn't. The other option for RBS was to break it up, and it doesn't look like that's going to happen. Not under government control, anyway. Critics of the limited actions taken since the 2008 financial crash say that Britain needs smaller regional banks and more competition. The lack of competition became a bigger issue in 2008-09, when foreign banks quickly withdrew from the market. More entrants can be expected, as the financial system returns to something that looks more like normal. This week, a new savings offer was put on the UK market by the financial arm of Renault, the French carmaker. But small banks risk being gobbled up, returning us to Britain's giant bank problem. TSB was spun off from Lloyds Banking Group, under European Commission instruction, but within months, it had been bought by Spanish bank Sabadell. The Clydesdale Bank, including the Yorkshire Bank brand, is to be floated by its Australian owner later this year. It's not clear that it will remain independent for long. 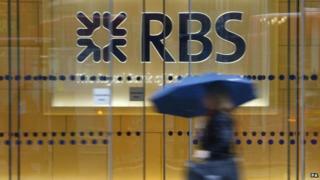 In exchange for state aid permission from the European Commission, RBS is having to sell a sizeable chunk of its operations, which are soon to be floated under the old Williams and Glyn brand. This, too, could be vulnerable to takeover by a foreign owner. But one lesson from carving that out of RBS in preparation for a sale is that it is fiendishly difficult and expensive to do. Breaking up banks, in the hope they'll function better and be less of a risk in smaller units, is anything but simple. So could RBS, without a controlling government stake, itself be vulnerable to a bid from a rival, if it is felt to be undervalued by the market? Investors or rivals may consider it ripe for break-up, if it reckons the sum is worth less than the parts. That could be painful for its headquarters in Edinburgh. The prospect also raises the question of what protection, if any, the UK government wishes to put round it while it continues its slow recovery. And the reverse is also true. An RBS in wholly private hands will be able to choose its own destiny, away from Treasury interference and the electoral timetable - perhaps expanding into new markets and acquiring others, though taking a bit more care about doing so than it did under Fred Goodwin. Quite apart from being allowed to pay dividends again, that could unleash a bit more dynamism into its executive suite. Without being further broken up, RBS, including NatWest and Ulster Bank, remains a huge national presence in retail, and even more so in its share of small and medium-scale business lending. It has shed most of its risky investment bank division, its sprawling overseas interests, its aviation finance wing, its commodity trading division, and it's on the way to shedding its Citizens Bank subsidiary in the US. It's now crunching through its branch network, in response to changed consumer behaviour. Whatever the price when the shares come on the market, buyers will be taking a stake in a much slimmer Royal Bank of Scotland than the one taken on by the government back in 2008-09.